Plant biologists have discovered that when a leaf gets eaten, it warns other leaves by using some of the same signals as animals. This new work is starting to unravel a long-standing mystery about how different parts of a plant communicate with one another. A plant injured on one leaf by a nibbling insect can alert its other leaves to begin anticipatory defense responses. Animal nerve cells talk to each other with the aid of an amino acid called glutamate, which, after being released by an excited nerve cell, helps set off a wave of calcium ions in adjacent cells. The wave travels down the next nerve cell, which relays a signal to the next one in line, enabling long-distance communication. Working in the model plant, Arabidopsis, Toyota et al. show that this systemic signal begins with the release of glutamate, which is perceived by glutamate receptor-like ion channels. The ion channels then set off a cascade of changes in calcium ion concentration that propagate through the phloem vasculature and through intercellular channels called plasmodesmata. This glutamate-based long-distance signaling is rapid. Within minutes, an undamaged leaf can respond to the fate of a distant leaf. Animals require rapid, long-range molecular signaling networks to integrate sensing and response throughout their bodies. The amino acid, glutamate, acts as an excitatory neurotransmitter in the vertebrate central nervous system, facilitating long-range information exchange via the activation of glutamate receptor channels. 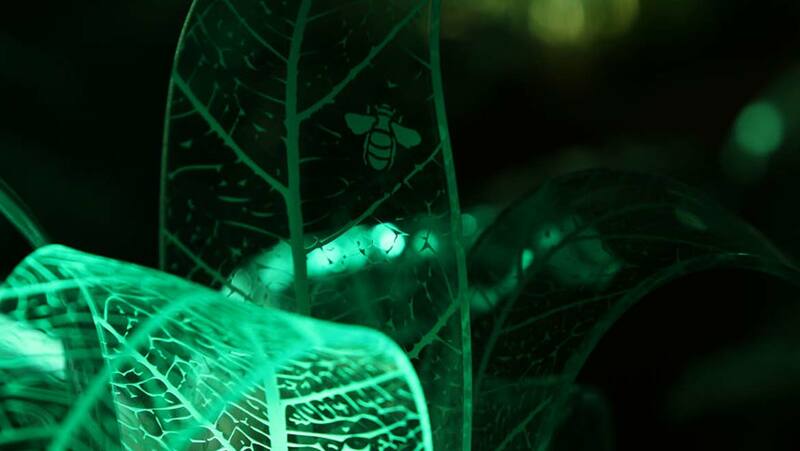 Similarly, plants sense local signals, such as an herbivore-attack, and transmit this information throughout the plant body to rapidly activate defense responses in undamaged parts. Glutamate is a wound signal in plants. The ion channels of the glutamate receptor-like family act as sensors, converting this signal into intracellular calcium ion concentration, which propagates to distant organs, where defense responses are then induced. Ca2+ is the fifth most abundant element in the Earth’s crust, yet high concentrations are cytotoxic because of precipitation of phosphates, proteins, and DNA. Homeostatic mechanisms to maintain low cellular Ca2+ evolved early, with the ability to pump the calcium ions out of the cytosol into the extracellular space. Maintaining the 10,000-fold gradient of Ca2+ across the plasma membrane, the largest ionic gradient found in living cells, is energetically expensive; therefore, it was advantageous for cells to co-opt the Ca2+ homeostatic machinery for signaling. Changes in the concentration of Ca2+ in the cytosol and other intracellular spaces participate in complex and dynamic signaling systems in all the kingdoms of life. 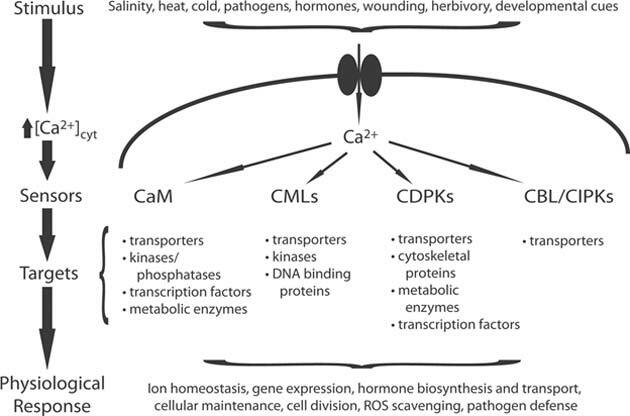 The Ca2+ signaling toolkit of ion channels, pumps, and regulatory mechanisms was present in the common ancestor of the plants and animals because many of the components are shared between modern animals and the chlorophyte algae. However, at some point in the transition from chlorophyte algae to land plants, selective pressure resulted in the loss of some components of the consensus toolkit, such as entire classes of Ca2+ channel and radiation of alternative mechanisms for Ca2+ signaling in the land plants. Calcium is an essential plant nutrient required for growth and development, especially of the root and shoot tip. The tips are meristematic, and cell division occurs by mitosis. Calcium ions help in the formation of microtubules and microtubules, which are, in turn, essential for the anaphasic movement of chromosomes. Ca2+ is an important divalent cation and is required for structural roles in the cell wall and membranes where it exists as calcium pectate. This accumulates in the cell wall and binds the cells together. Calcium ions are also required as a counter-cation for inorganic and organic anions in the vacuole and as an intracellular messenger in the cytosol. Externally supplied Ca2+ reduces the toxic effects of NaCl and ameliorates stress. Ca2+ is required for pollen tube growth and elongation. Calcium was first described as an essential macronutrient element in plants more than a century ago. Ca2+ is taken up by roots from the soil solution and delivered to the shoot via the xylem. Ca2+ may traverse the root either through the cytoplasm of the cells, linked together by plasmodesmata (the symplast), or through the spaces between the cells (the apoplast). The cytosolic free calcium ion concentration is typically maintained at 200 nM. However, the Ca2+ content of the cytosol is far higher than this because of the high affinity of Ca2+ to a range of binding proteins. The mobility of the ions within the cell is very low as a consequence of its low free concentration and rapid chelation. It moves predominantly apoplastically rather than symplastically. Plants vary markedly in their Ca2+content and requirements. Ca2+ content can range between 0.1 and > 5.0% dry wt. for different plants and organs. Soil calcium also varies widely from < 0.01% calcium in acid laterites to very high abundance in chalky soils. The important calcium sensors in plants are calmodulin (CaMs), calmodulin-like proteins, calcium-dependent protein kinases (CDPKs), and calcineurin B-like proteins. What are Calcifuges and Calcicoles? Ecologists have classified plant species into calcifuges and calcicoles. Calcifuges are plants occurring on acidic soils with low calcium. The term calcicole is used to describe plants, which can grow on calcareous/Ca-rich soils. These soils are generally calcium- and base-rich soils. However, plants vary in their Ca2+ requirements and the ability to extract these ions from complex soil environments. In particular, monocots require less of this element for optimal growth than dicots do. The ions enter plant cells through calcium-permeable ion channels in their plasma membranes. Ca2+ competes with other cations both for these sites and for the uptake from the soil. The presence of high levels of Ca2+ is known to ameliorate the effects of the uptake of toxic cations (Al3+ and Na+) from the soil while the presence of high levels of other cations (K+, Mg2+) may reduce Ca2+ uptake. Calcium uptake and requirements for optimal growth are thus strongly dependent on the presence of other cations. Calcium deficiency is rare in nature, but it may occur on soils with low base saturation or high levels of acidic deposition. Calcium deficiency may occur because of competition by other cations, or because of low transpiration, where the xylem flow is inadequate to supply the calcium requirements of rapidly growing tissue. Calcium deficiency results in stunted root growth and altered leaf appearances. More severe symptoms generally result from the failure of cell membrane integrity, for example, bitter-pit in apple fruit, blossom end rot in tomato and tip burn in lettuce. Deficiency symptoms first develop in the regions of the plant most distal to the region of Ca2+ uptake.